This variety is one of the rarities among 1806 half eagles, and was listed as “R-7, possibly R-8” by Walter Breen in his 1966 monograph. 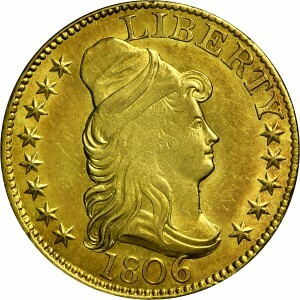 Apparently this is the only obverse with the digit 1 clearly separated from the lower hair curl. Many of the descriptions in Walter Breen’s 1966 monograph are sketchy and often incomplete. 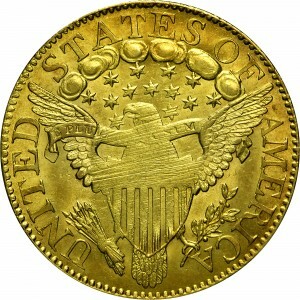 Despite Walter Breen’s rarity discussion, two examples of this die marriage were acquired by Harry Bass. This is the finer of his examples and quite possibly the finest known. "Obverse: Wide date, spaced 1 806. 1 free of curl, and lacks bottom left serif. Tip of 6 overlies drapery. Tall numerals. Large LIBERTY. Normal T. Head well hubbed, but central portion is quite flat, as all are of this die. Reverse: Large D and A. Normal Ts. Very weak in central region - breast and shield top."